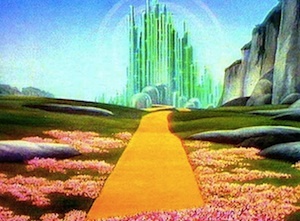 Is "Google Me" Codenamed "Emerald City"? And Why Is Google Baraza Copying Quora? It’s no secret that Google is working on a new social project that is thought to be a layer which will be spread over many of their properties. Actually, it is supposed to be a secret. But everyone knows about it. At first, it was known as “Google Me”, but that’s probably not what it’s going to end up being called when it rolls out at some point next year. And if you believe an anonymous answer on Quora, that’s not what Google is internally calling it. And based on what we’ve heard, they may just be right. Emerald City has been integrated into numerous products and is being actively used internally. Emerald City is the project name for what people outside of Google refer to as “Google Me”. Lots of existing projects like youtube, google docs, search, calendar, groups, picassa, etc have had significant social integrations added to them. This is an ongoing project that will launch as a major initiative across multiple services at once and many of the hooks endusers will see are currently being tested internally. It is by no means done and is extremely ambitious in nature. Here’s the thing, we had actually heard that nickname before as well. Well, actually we heard “Emerald Sea”, but this makes more sense (update: see below, nope, it’s “Emerald Sea” after all). Further, the other details are inline with what we’ve been hearing about the project. Of course, the fact that it’s thought to work with YouTube, Google Docs, Search, etc, would be an easy and obvious guess to make. Still, unless we have the same source, the anonymous Quora user may be on to something. But perhaps even more interesting may be the fact that the exact same answer was posted almost two weeks later to Google Baraza. Wait. What the hell is Google Baraza? It turns out, Baraza is a service that Google very quietly launched in late October. In fact, the blogs that closely watch Google didn’t pick it up until a couple weeks ago — see here and here. Google states that Baraza is a service meant intended to be used in Africa to bring more locally relevant information online. So why is there a question and an answer about Google’s new social product on Baraza? Because some people are using it like Quora. Probably because it is a lot like Quora — you even search and ask a question in the same box. While Google talks about Africa, anyone in the world (who speaks English or French) can use it. I just set up an account simply by asking a question. And even the idea behind it sounds like Quora — to get things out of people’s heads and onto the web. Anyway, back to the matter at hand. Someone has posted the exact same answer about Google’s social product to both services. Could it be a Google employee? Certainly that would explain how they knew what Baraza was in the first place. But why would a Google employee go out of their way to answer the question and out a secret project on not just Quora, but also on another Google-run project? Maybe it’s more likely that someone simply copy & pasted the answer from Quora. It is interesting just how much action there is around the question though. So, we now have two new pieces of Google intrigue. First, Google may be internally testing their social product which they’re calling “Emerald City”. Second, Google is definitely testing a Quora competitor. And while it may have meant the test for Africa, clearly others are using it as a universal Google Q&A service. Google just better hope that Emerald City doesn’t end up like Google Answers.